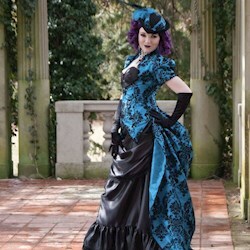 Alternative wedding gowns from auralynne are perfect for Gothic, Steampunk, Victorian and Fantasy themed weddings. Making her own patterns, auralynne creates unique dresses, cut on figure flattering lines and custom made to your measurements so you can be confident you'll feel comfortable and look gorgeous on your big day! Self confessed Victorian Era nut and perfectionist, auralynne is passionate about what she does and you can see that in the exceptional designs on display. As well as unusual wedding dresses, auralynne handmakes various other clothing and accessories for your dream bridal outfit. Including jackets, shrugs and cloaks; hats and headpieces; gloves and stockings and a whole load more. Ships worldwide from Rhode Island, USA.